Sometimes doing an estate sale by yourself can be overwhelming, physically and emotionally. Estate sales are not just for handling the items of a deceased person, but can be used to downsize when a parent moves to an assisted-living facility or to a smaller, more accessible home. When should you consider hiring someone else to handle your parents estate sale? 1. If you are overwhelmed and simply do not know where to begin. Calling in experts can alleviate the time and effort it takes to put on an estate sale. 2. Professionals can make the hard organizational decisions such as what to keep, what to sell, and what to give away. During this initial inventory be sure to remove items that family members/beneficiaries want to keep or items to be given to charity–although in some states donations will not be considered in the final accounting of owed estate taxes. Generally, after the professional inventory, the contract made with the estate company will prevent removal of any item after a certain date. 3. Experts can better determine asking prices for estate items. Besides their expert knowledge, pros also have reference materials and catalogs to assist them in pricing items. Identify length of sale and potential price reductions. A 2-Day estate sale will usually have the final day set for markdowns and/or bid awards. 4. Make sure that the estate sale experts are licensed and bonded. Liability issues including fair pricing practices can arise. 5. Free initial interview. Additionally, at the initial “free” interview and walk through, the experts should be able to give you a rough estimate of what the sale could net. 6. Any contract should stipulate the costs of the expert services. A minimum amount charge for their sale can either be a flat fee, say of $1500, or a percentage of the sale, usually 25%-40% depending upon the size of the estate sale and the number and size of objects to be priced and sold. 7. What You Pay For. Services rendered by the pros should include set-up, pricing, after sale clean-up and and disposal of unsold items to charity, etc. If any of these services have additional charges attached to them, make sure that is established and listed in the contract. 8. Set-up. An estate pro should be able to organize the sale by room, and should provide additional tables and linens for displaying your items advantageously. Small valuables items like jewelry should be displayed in locked glass display boxes. 9. Ask How Sale Will Be Advertised. Advertisement should include advertising in the classified, on the internet, signs, and fliers. Ideally advertising should include pictures and an inventory of items for sale. These costs should be indicated in the final accounting. 10. Final Accounting. Make sure that you get an itemized accounting that should include gross sales, all fees and services, value of donated items with net amount made out to the estate. TIP: You can lower your costs by being involved in the process; however, some pros will prefer that family not be at the sale. Pricing. Pricing is the most difficult part of the estate sale. Each sale item category has special considerations that affect its’ price. Unlike auctions which offer the opportunity of potentially realizing the full retail value of a particular item or exceeding it, pricing for an estate sale requires knowledge not only of the item, but experience as to what the market will bear. Popularity. Local popularity for a particular style will influence its price. As mentioned in previous postings, solid oak furniture pieces especially in arts and crafts or mission are popular in MDM’s area and, therefore, command near retail or book prices. These are pieces bought by collectors and home owners rather than items for resale by dealers. However, kitsch items of the 1950’s through 1970’s or novelty items are not as popular and afford an opportunity for those looking to transport and resell merchandise in another, larger metropolitan area. Depending on the condition and rarity of the item, a dealer would expect to pay 50% of the retail value or less, and no more than 66 2/3% of the book price if the piece is in excellent condition and if the local offerings have not been plentiful and his/her need is great. Keep in mind that the best price dealers like to pay is a price that allows them a sale with a 2 1/2 X markup. Reference Books. Go to bookstores or to the library to get books on collectibles, antiques, furniture, etc. to use as a guide in pricing items. Also pool the expertise of your family, friends, and neighbors–we are all shoppers of one thing or another! The Art of Haggling. You will get counter offers from the very start of the sale. Designate a person who has either done the pricing or who possesses the most knowledge on the various items for sale to either accept or refuse offers. Plus, you want to choose someone for this task who will not be personally invested in the sale and cannot make the hard decisions of parting with an item, let alone reducing its price. Remember, drastic reductions should not be entertained at the beginning of the sale unless the item has been wrongly overpriced or has an issue such as damage which was overlooked. However, one should not be hesistant to consider an offer and to move the sale along. Be prepared to consider offers of items that have been individually priced, but combined in a set by a potential customer. Also, adjust prices should there be a lack of traffic or interest for certain items in the sale. Display. Besides tablecloths, tables, dish racks and furniture pieces to display items, portable garment racks may be needed in addition to closets to hang garmets. Large quantities of scarves, lingerie, aprons can be put in uncovered boxes if limited space is a factor. Buyers love to dig through boxes! Clean. If possible clean items. Glasses, pots, and even bedspreads sell faster if they are clean and do not have musty smell. MDM recalls using Oxiclean for a collection of chenille bedspreads that had been stored for sometime and this product removed the yellowing that occurs on whites in a jiffy. Planters and dishes should all be spotless. Dirt drasticallly decreases the value of any item. Additionally it is good to have the floors, counters clean and carpets vacuumed to enhance the overall appearance of the sale. Air out the building, turn on all the lights, and if it is a warm day open up windows especially on the upper floors. Traffic. Take a walk through the entire place to identify any obstacles that might pose a problem for customers especially the handicapped or others. Identify the traffic pattern and keep it clutter free. Notify the Police of the Sale. This is important in those areas where parking is a problem. Some city ordinances require alternate side parking during certain months, or certain days of the week. Informing the police of the sale will prevent tickets being given to your customers if it is necessary that both sides of the street are used for parking. However, your customers should be gently reminded not to block driveways or access to sidewalks. Man The Sale Early. Helpers should arrive at least 1 hour before the sale is to begin to make any last minute arrangements and to get organize or to make any last minute adjustments. No Early Birds. Be assured you will have many attempts to gain access to the sale earlier than publicized. Dealers have been known to offer to pay an admission fee to be the first ones into the sale. MDM believes that it is best to be even handed with everyone and not to give preference or to accept bribes. This is especially important if you intend to hold any future sales. If family members have not had a chance to retrieve items and everyone is in agreement, arrange for them to do so the evening before the sale. To maintain a fair share between the relatives, any items taken should be written down along with the retail price since this will count towards their share of the estate as well. Classified ads. Sell large pieces individually in the paper, e.g. furniture, washer and dryer, etc. You may be able to even sell them without paying any advertising fee [check out posting on Free Print Ads for Selling Stuff]. Local Auctions. If you have a number of nice or unusual pieces bring them including any thing that was not sold but is in decent condition to a local auction house for sale. Donations to Not for Profit Stores or Shelters. Most items will be taken except for nonfunctioning electronics or used mattresses and these donations can be taken as a tax deduction; however, you must receive an itemized receipt with a dollar amount assigned. If you have quite a bit of merchandise left, most of these stores have trucks that will come to the house and pick it up. Be sure to call ahead to make arrangements and to ask what items they will not accept. Free Sign. Haul the items near the curb and label with a "free" sign. If all these steps are taken and anything remains it will be curbside for the garbage haulers. Although McCoy has manufactured this line from the 1940’s to 1970’s, Floraline became commercially popular in the 1960’s for McCoy with the floral industry. The molds were simple in design and were produced for companies such as FTD and Teleflora. Colors were limited to the popular white and green. Although you can find character pieces and artisan pieces with more intricate designs, MDM particularly likes the simplicity of this line since it fits into both modern design, minimalist, and arts and crafts. 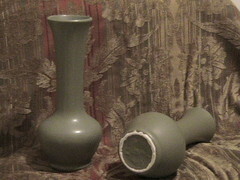 These photos show a bud vase that came in green(shown), white and yellow tan. With a retail price under $20 they are highly collectible. MDM found this pair at two different thrift stores and paid between $2 and $3 each. Another style and one that Martha Stewart displays in her paint brochures is the Dozen Roses Vase in white which is similar to this style except that it has a small pedestal foot at the bottom and retails for around $25. Because these items are not rare as yet, the likelihood of finding Floraline items is good. It is always better to find a pair since a set is more preferable and therefore more valuable. However, don’t hesitate to collect just one, chances are you will be able to find another one in the same color–it is only a matter of time. Marks. 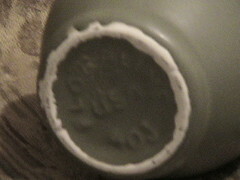 This second photo shows one of the marks used by the manufacturer. Note that although this line is definitely McCoy, there is no McCoy mark only Floraline. Some McCoy pieces do not have any identifying mark on the bottom except a "USA" and pattern number. That is why it is necessary for bargain hunters to acquaint themselves with the style and history of these american potters. Remember condition is important, therefore, because there are a number of these items still around, only accept flawless items. Since this can still be a thrift store or garage sale find, It is a very affordable collectible right now and with its simple design, a versatile addition to any decor. As MDM says this is a better thing, this is a better buy and now is the time to collect it. An estate sale is a difficult diy project. Before attempting it consider your options and investigate the cost of alternatives such as a professional estate seller, or auctioneer. Rare antiques should be appraised. With particularly valuable item(s), you may want to contact an auction house such as Sothebys, Christies or Bonhams and Butterfields to auction the item(s) since they have a specialized clientele. PERSONNEL. If you still want to go ahead with your own sale, know that you will have to enlist the help of family and friends if the estate is particularly large. You will need at least a couple of people on each floor to answer questions on prices and to prevent stealing or switching price tags. Optimally, it is good to have two people at the check-out table, one to wrap the article and one to record the sale items and produce a receipt. If you have a separate entry, you will need a person manning that. If the sale includes items housed in a garage, you will need 1 to 2 people for that area alone. Additionally, just to be on the safe side, if you have a couple of able-bodied men, enlist them to help carry-out and load large pieces of furniture. LOGISTICS. Usually estate sales are held in the home of the decedent or owner of the items to be sold. Sometimes large estates with many valuable pieces are held in rented halls. There should be a separate entry and exit if possible. This prevents confusion and makes the sale more manageable. Therefore, you will need someone giving out numbers early in the morning and when the sale opens, calling out the numbers and collecting the tickets. Be sure to block off rooms that won’t be used for the sale. If you have keepsakes that are not removed prior to the sale, locate them in a separate room, preferably under lock and key with a "do not enter" sign posted. If you are unable to secure the room by locking it, then in addition to posting the do not enter sign, crisscross the door with large yellow tape. Locate a table near the exit door for checkout. You should have a table large enough to hold an adding machine, a cash box, and store bags, boxes, and newspaper or bubble wrap under it. Tags. You will need tags for marking the merchandise, and large signs to be posted if you are grouping items together rather than itemizing each such as books and apparel, etc. I usually use colored self-sticking tags and I code the color to a particular item, e.g. red for furniture, yellow for linens, white for household, etc. This will cut down on switching prices. Numbers. Some people buy a roll of tickets, others use colored paper and make their own. Estimated traffic and price probably will determine what you use. Tables. Furniture to be sold can serve for display of glassware, antiques, and other valuables. Cupboards can house kitchenware, be sure to keep cupboards open for access. Locate any extra folding tables since you can always use them. Be sure to cover them with a tablecloth since it enhances presentation, and eye appeal is a necessary component of any sale. You can use dish racks to display decorative plates in an upright position. Runners. If you want to protect carpets or flooring be sure to lay down runners, but tape them down so that buyers will not trip on them. Signage. You will need Enter and Exit signs. Optional signs are a Checkout sign and if you are accepting checks be sure to write out how or to whom the check should be made out to, for stairways you may want to post Watch Your Step signs or Please Use Handrail, or for low ceiling basement stairways, a Watch Your Head sign. Include any sale signs. There may be items in the sale that are not priceworthy, you can offer these items outside in a box with a Free sign. Cash box. Be sure to have an initial minimum cash box of $100.00 which should include $1, $5, $10, $20 and coinage. A cash box with a removable tray allows checks to be housed under the tray and out-of-sight. Bid Box and Bid forms. On large pricey items, a bid box allows a seller an insurance policy that these items will be sold. Be sure to have slips ready with item description, bid, and the name and phone number of the bidder. Be sure to make clear when the bids will be read and the buyer contacted to pay for and remove the item. Boxes, Bags, Newspaper. You will need these to pack the sold items. Check out the local grocery stores for boxes, and check all family members and friends for plastic and paper bags and newspapers. You will be surprised how these supplies are quickly depleted. Markers, pens, and extra paper are items to have on hand to mark sold or to put the buyer’s name on a box. Adding machine rolls and/or receipt pads are necessary to keep track of sales. Tape measure is a good thing to have on hand especially if a buyer wants to measure a particular piece of furniture before buying it. Be sure to put your name on it so that you get it back. SAFETY AND OTHER CONSIDERATIONS. It is a good idea to check to see if the insurance policy on the site of the sale, e.g. homeowners policy is current and has enough coverage in case a buyer would fall or injure themselves. Keep a keen eye for any hazards and mark them with a sign, precaution and prevention are key words in any sale. ADVERTISING. You will find that advertising in the local paper under Estate Sales is about double in comparison to other sales such as garage or rummage sales. A cost cutting measure is to advertise in the regular rummage sale section but be sure to add in bold or capital letters "EVERYTHING MUST GO" or "SELLING OUT TO THE BARE WALLS." These are clues that this is indeed an estate sale. Be sure to mention popular items with name brands, e.g. antiques, McCoy, Roseville, etc. Add other items such as vintage clothing, linens, antique furniture, collectibles, household, and any unique items e.g. Laurel and Hardy large plaster figurines. Large machinery such as snowblowers, and tools should be mentioned and if possible you can have an earlier, separate time set for viewing sale items in the garage. If it is a two day sale, run the ad both days and if possible remove number information on the second day and replace it with a markdown notification, e.g. 50% off items under $50. Estate Sale Signs. You can post these signs on telephone polls. Post these signs at the busiest traffic intersections, etc. nearest to the sale. It is especially helpful if these sections have traffic jams during rush hour since the driver and passengers will get a better look at the information. Give date, time and location. These signs can be purchased at building supply and hardware stores and a few should be given to you free from the newspaper when you place the ad, they may not say estate sale, but you can add those words. Be sure to post these signs a couple of days before the sale. If the sale is on Saturday, be sure to post on Thursday, or no later than Friday at rush hour. Check on your signs and replace any that are taken or destroyed. Post Large Estate Sale Sign in window of residence and one near the boulevard with an arrow, this one should be printed on both sides so that both lanes of traffic can see it. Location. Be sure to obtain a good map of your area as valuable time can be waisted looking for a particular address. No leaf or location should be overlooked in bargain hunting. Conventional thought would have you believe that the best estate sales can be found only in the upscale areas of their city or community. However, this assumption can result in a lost opportunity for the bargain hunter to uncover a great sale, or a great treasure. One of the best estate sales MDM attended was out of a small bungalow house in a middle class neighborhood. There was so many treasures at that sale, that the sellers had to hold the sale over three consecutive weekends and many of the items were in mint condition! Second Day Sale. Many people believe that no bargains can be found at an estate sale later in the day or on the second day of a two day sale–that by then the dealers and other knowledgeable buyers have bought all the valuables or finds. Not necessarily so. Dealers look at items as to how much profit is in the resale of an item, or certain items may not be what they specialize in. That is why it is worthwhile to take the time to give any sale a once over even if it is late in the day. In fact, many sellers are open to negotiations on price late in the day or on the last day of the sale. Usually the last or second day of the sale, 50% markdowns are taken on items priced $25 or $50 and less. The bigger sticker items that are left are usually sold by bid. If you took the time to do a once over on the first day and identified an item worth your consideration at a better price, please note its location (if the sale is large enough it probably will not be moved for the last day of the sale), and make sure you are one of the first ones lined up to purchase it on the second or last day, because the race will be on! Don’t Overlook Items in the Garage or Basement. Not all the valuable pieces are found in the livingroom of an estate sale. In fact, many professionals shop estate sales in pairs with one heading for the garage while the other shops the areas in the house. MDM found a federal buffet table in mint condition tucked in a corner of the basement largely overlooked because of items on top of it. Many large oval copper containers, a popular design item, are found in garages as well as advertising crates in basements. Be sure to check out every nook and cranny of a sale. Salting a Sale. Just like in past years, mines were salted with valuable gems to deceive a buyer of the value of the mine, estate sales can be salted. A few good pieces can give the impression of authenticity to other items which may be reproductions, albeit very good reproductions. Other times, a seller will bring in merchandise that wasn’t sold at other sales, or pieces on consignment. All these practices raise red flags about the entire sale. How can you recognize these practices? The best way is knowledge, be knowledgeable of what you are buying especially if it involves an expensive item. Know the seller or who is handling the sale, ask others to find out if they are fair and forthcoming about their merchandise. Items that do not seem to go with any collection in the sale, or seem out-of-place with the decor are warnings. One seller was pretty obvious that he/she had consignment goods since the price tags had different initials penned onto the tags. Bag and Tag. Come prepared to take items home just in case the seller does not have enough boxes or bags and other material t0 insure that you get your prizes home safely. If you believe there will be a number of items you want to purchase, bring a box along and put your name on it and place it in back of the checkout table. This way you can add items to be purchased and keep them safe until you are ready to pay for them and you will be freeing up your hands to search for more treasures. 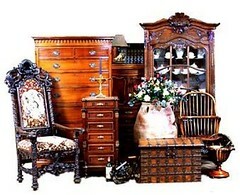 If you were not prepared to buy a large piece of furniture, but found one you cannot part with, take a piece(s) of the item with you while you go get help or a trailer–taking drawers out of a bureau or dresser, etc., helps prevent that item from being sold if you have to leave to make arrangements for its transport. Estate sales are fun to go to, but they are not for the faint of heart especially if you live in the colder regions of the country as they require you to rise early in the morning and stand in line to get your number to be invited in to hunt for that bargain or rare find. In looking at the ads for estate sales, it is always a good idea if you know the professionals handling the sale. A few estate sales are done by family members, but the vast majority are done by professionals who normally take 20% to 40% to cover the cost of the ad, organizing the household items (and clean-out), pricing, and providing staff to handle the sale. If you do enough estate sales, you will get to know firsthand or by speaking with other bargain hunters, the quirks and backgrounds of the various estate sale planners/sellers. You will get to know the ones that have fair prices, the ones that cut private deals with the antique dealers (discussed later), their individual expertise, and how to bargain. Most of these professionals are honest, hardworking individuals. I have done a family estate sale and believe me it can be a lot of work depending on the size of the estate. Numbers. Numbers are given out by the seller to designate the order buyers are allowed into the sale e.g. 1, 2, 3… Antique dealers try to get in as early as possible, and some will do almost anything to accomplish this. MDM has found that at some estate sales, “prenumbers,” are given out. Now, you may ask yourself “what are prenumbers?” They are numbers usually given out by the earliest arrivals and are not the official numbers. These prenumbers are exchanged for the real numbers when the time arrives to pick-up numbers as stated in the newspaper. MDM deplores this practice since many unsuspecting people arrive on time to get their number, only to be surprised when there are 5 people there, and the number you are given is 15 or 32! Why are numbers important? Like the proverbial early bird, the first look garners the rarest finds, the one of a kind. Like antique dealers, estate salespersons have expertise in certain areas and, therefore, prices will reflect that expertise. Some are experts on furniture, others on porcelain, still others on artwork, etc. The breadth of expertise is usually determined by their individual passions. It is an impossible task to be an expert in every genre. Therefore, there are always items that are undervalued, sitting on the shelf, in the closet, or the basement waiting to be discovered by a knowledgeable hunter. These are the “finds” we all dream about. The mission magazine rack made in Philadelphia, missing its top shelf (a find for restoration). The $30 depression vase for $1.00! Estate sales provide a good opp0rtunity for those starting out in a new apartment or furnishing their first home since antique furniture is usually solid wood that will increase in value through the years and outlast many contemporary pieces made with veneer overlayments of particle board or mdf. Even if you pay premium prices for these pieces at an estate sale, they are usually less expensive than comparable value bought in a high end furniture store. Bidding. With many high end pieces, unless a truly wonderful find presents itself like a massive mission china cabinet for $1000, you will have an opportunity to place a bid on them. I usually will go with 50% of the asking price plus a little more for a bid to create an odd rather than even figure depending upon the rarity and condition of the piece. A reputable seller will have a box where the bids can be placed and not opened until a designated time, usually early on the last day of the sale. However, I have known sellers to go through the bids and tell an interested person what the current bid on the piece is–run don’t walk away from these people because they are using your interest to raise the price for whatever reason known to them and hidden from you. Listed Prices. Most items will carry a price on them. Some items may be sold in bulk with a general sign posted listing prices, e.g. books unless specifically marked may be $2 each, or $5.00 a box, or canning jars may be 10 cents a piece, or 12 for $1.00. Be hesistant if you find a number of items without a price or a sign listing the price. Some sellers once they see your interest in a particular item will look over the piece with a fine tooth comb and come up with a higher price justifying that price by expounding on the value of the piece and thereby destroying the possibility of getting a find (remember, they can’t be an expert on everything and your interest raises a red flag that they have overlooked or undevalued this item). Another reason is more surreptitious. The seller uses your peaked inquiry to raise the price higher than other similar items at the sale. There was one professional seller who did this as a standard operating procedure, therefore we never went to him for a price quote, but to his staff instead. They finally got on to this and refused to give a quote, but referred an unmarked item directly to him. Now, there are some buyers who will try to switch tags or remove the price in order to get a better deal. Such a practice is the reason that estate sale employees staff every level of a sale, and are constantly floating not only to spot shoplifters, but these practices as well. MDM considers this equally reprehensible. It is far better for a buyer to simply ask if that is the seller’s best price, or if he/she could do better. This leads to a sacrosanct rule for any type of bargain hunting: Never Be Afraid To Ask For A Better Price. What’s the worst that can happen? Right, they can say “no.” Timing has a lot to do with getting a better deal. Such a question would not produce any results early in the sale, but near closing time or on a second day of the sale, your chances are greater at arriving at a better price. But don’t make the offer a ridiculous one, e.g. on a $50 item don’t offer $2. Such a disparity between the buyer and seller begs the question as to the legitimacy of the offer. Consider what it is worth to you and make a offer which allows some give and take to arrive at that figure. Be Prepared. This means several things. First of all, determine how you are going to pay for a find. Does the seller take checks or only cash (there are a few that will take charge/debit cards). Second, can you get the item(s) home. If you can’t transport it, or make arrangements to transport it, you can’t buy it. Sometimes the transporting of the item can equal the cost or more, e.g. a piano. Finally, keep reading those antique books and design magazines, watching the Antique Road Show and other media events, going to estate sales and antique stores, and checking this site for upcoming tips and reports. Bargain hunting is a continuing education course, exciting and like any other field the more you know, the better hunter you become.